Back when I reviewed the Super Robot Chogokin Grendizer, I noted that it took a rather long time to be released into the line after Mazinger Z and Great Mazinger. Bandai apparently decided that wasn’t enough and kept the Spazer in near vaporware status after its initial announcement with blink-and-you’ll-miss-it teases at hobby shows. Then it was finally given a release date and web exclusive status because poor Grendizer must’ve drew the short stick or maybe the dart game that arbitrarily decides release status was played by a severely drunk marketing department. So here we are exactly two years after SRC Grendizer’s release and the Spazer is finally in our hands. In a painful display of grasping for straws, the official Tamashii website likes to point out that this release marks the 40th anniversary of the TV show as if that’s supposed to mean anything or justify the delay. If we’re lucky, we might get a SRC Double Spazer in time for the 45th anniversary. Despite coming in the standard web exclusive brown cardboard box, the box inside is in full color instead of monochrome like pretty much every web exclusive SRC box I’ve ever seen. Inside are two plastic trays housing the Spazer and its accessories. The wings need to be attached to the main saucer body. The process is a little nerve-wracking because you have to insert each wing then push down hard on them until the two outer tabs go through and lock the part in place. To attach the discs to the arrow-shaped hardpoints on the wings, you need to slot the arrow into the side of the disc then rotate the latter until the arrow pushes the curved edges of the tab on the two interchangeable plates outwards. Once the plates are removed, align the slot on the disc with the one on the arrow and reattach the plates. The same rotation gimmick is used when you want to detach the disc from the wing. With everything attached, the large plastic hamburger has a length of 16cm to the tip of its tail fin and a wing span of 28cm. It is made entirely of hard plastic and has metal screws inside. The saucer balances fine on its belly, but if you want you can pop out a trio of landing struts on its bottom to make it a tad more stable on flat surfaces. The cockpit canopy is represented by a glossy blue paint app. 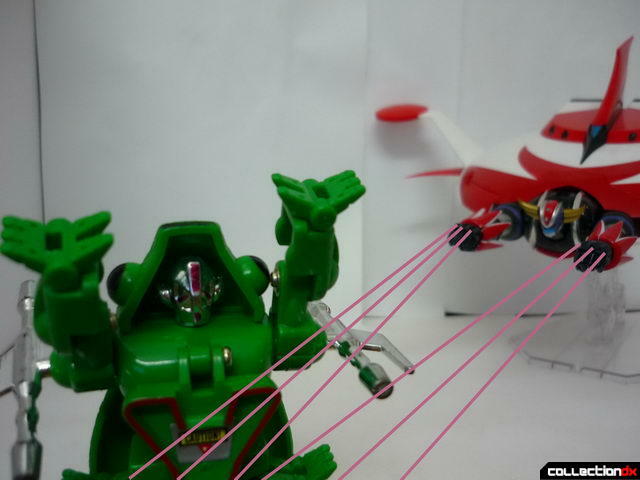 The Spazer comes with a pair of hands for SRC Grendizer, saucer disc accessories, and more importantly a Tamashii Stage Act 5 stand with two support rods. Impressively, the SRC Spazer is large enough to house the entire SRC Grendizer figure. Bandai avoided the Metaltech’s corner cutting solution of just attaching the upper torso of the figure and they didn’t even implement any extreme limb contractions like on the SOC version. This is the pose you put the Grendizer figure in before you dock it with the Spazer. The ab joints need to be pushed in and the only odd limb placement is that you have to twist the hips so that the back of the legs are facing each other. You also need to attach the hands that came with the Spazer. The front of the Spazer needs to be pulled off, which allows two vertical panels to move so they can secure the Grendizer figure. 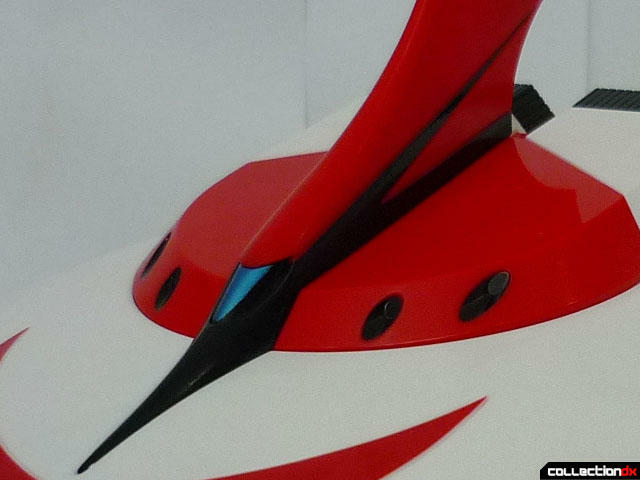 The back door opens and from there you can see the entire hollow space inside where the Grendizer figure will reside. Once Grendizer is inserted and secured, its arms can rest against the front sides of the Spazer which are spring loaded and can be pushed inwards. This reveals the tip of the small red wings that can be swung outwards. The tip is incredibly sharp so take care not to poke someone’s eyes out when you’re running around the house with the Spazer while going fwoooosh! Fidgeting with the arms might move Grendizer’s chest a bit, but he can be easily pushed back in place. At first I was a little disappointed that Grendizer’s entire chest is sticking out of the Spazer, but then I saw that pretty much all modern Spazer toys look like that. The only way the Spazer is achieving that clean round look while Grendizer is docked in the show is through anime magic. The docked Spazer looks awesome otherwise. Since Grendizer’s arms can still move, he’s free to use his own accessories. He can Screw Crusher Punch! He can also (with a little help from Photoshop)Hand Beaaaaaam! The saucer disc plates can be swapped out for a pair of Spin Drills and the drill can be moved sideways a bit. You also get the Spin Saucer plates in case you need to take out some pesky MiniFOs. Both disc accessories feature pointy bits but the good news is that they don’t require the arrow rotation gimmick to be removed. It took two agonizingly long years but the King of Space is finally complete (Relatively speaking of course. I want a SRC Double Spazer so bad right now.). Bandai released a Spazer set that included a Grendizer figure with a rescuplted head and painted in glossier brighter colors. Unfortunately, Bandai being Bandai they omitted the Space Thunder and rocket punch effect parts. The Spazer is great and I love it. It does everything I expected a toy of its size to and a little more. However, given the minor hoops you have to jump through to get what is a essentially a round plastic sleeve for your Grendizer figure, is the Spazer worth getting? Only if you’re a completionist. The Grendizer figure is fine on its own but like most SRC figures it quickly sold out at most of the popular online stores and there’s currently no re-issue in sight. If you don’t have the figure, don’t want to pay inflated prices for it and don’t mind the lack of effect parts you can grab the SRC Grendizer & Spazer set. Even if you end up paying 150$ for it you’re still getting more bang for your buck than the Metaltech set if you’re not too sold on the overhyped gimmick of anime accurate proportions. There’s also the fan darling Soul of Chogokin versions but without very good deal hunting skills expect to pay anywhere between 200-300$ for any of those. Very good review- thanks for covering the Spazer in such detail. Your description of the wings concerns me a bit. If the process of getting them in place requires that much force, will I be in danger of breaking something if I put everything together and then disassemble it to go back in the box? It's easier to remove the wings than it is to put them on, but I don't advise doing this process repeatedly. Attaching the wings once was scary enough for me and I had to do it another time for a friend's Spazer.